This document isn’t intended to fully cover each topic. Rather, its purpose is to familiarize you with Blender Python API. Is it possible to implement the P3D 1.4 SDK ? I wish to compile a large model, previously successfully done with FSDS. I can get the model to compile using the current P3D 2. setting and the 2.5 SDK however the model "cannot be displayed" in FSX. I understand the P3D 1.4 SDK will compile large models and is compatible with FSX. Any plans to update for PBR compatibility? I have followed a lot of tutorials on this group and youtube about animate with blender for P3D. Animation is working well in blender, i think i have understood the assign to object function but i have an error with export the mdl who don't work. I have the P3DV4.3 SDK installed . Is it the reason of my export issue ? Do i need another P3D SDK ? It would be helpful to know what errors you are getting... also, You said you had P3D v4.3 SDK installed, does that mean you are creating a model for P3D v4.3 or is it for another version of FS that you have installed? Yes i create for P3Dv4.3 and have P3DV4.3 , as well as blender on the same computer with only one SSD . all on defaut directories. I retried from 0 with the defaut blender cube. -Created smalll animation by added a Path curve and object constraint. -Change end to 1024 / inserted start keyframe at 0 and the end keyframe at 1024 ; added 40 keyframes between start and the end : animation is working well. 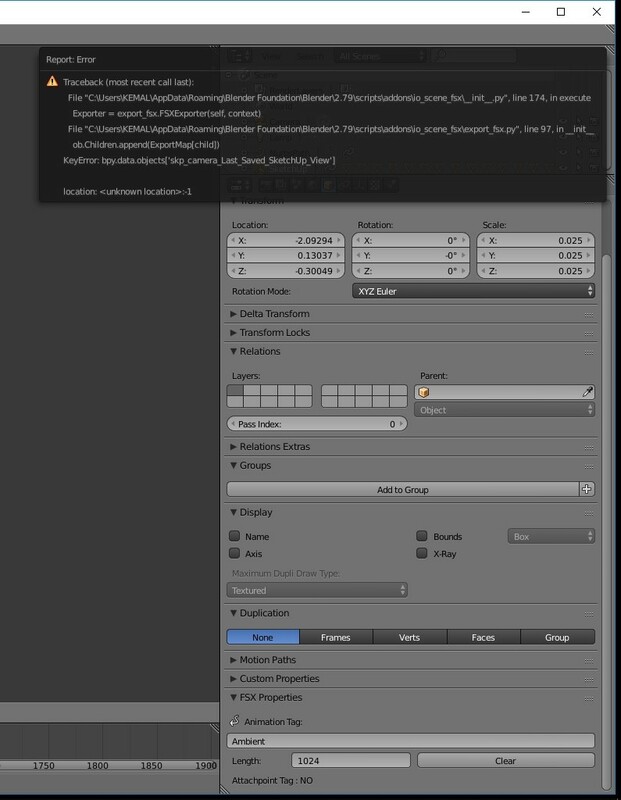 -From Blender2FSX/P3D : Use P3D SDK / ver4x SDK selected ; Initialize P3D tool set done. Change the Lenght to 1024 result in no erros in the export now ! animation is working on mcx ! i will now try with my vehicule object and report. The vehicle - is it for FSX? What version of the FS are the models for? Is this for FS steam? Like i said , all is for P3Dv4.3. The defaut cube from blender work but my bus from Sketchup no .animation is working in blender but i can't export. Do not hesitate to join your .blend so that we help you as best as possible. -If you have assigned a "material" on your object? Sorry join what ? and where ? I am testing with a simple cube but from sketchup to see if i can recreate the same good result that i am able to have with the blender defaut cube . He was referring to including your .blend file (attach it to here). It appears that you didn't initialize with the proper FS within blender. The error is referring to FSX and not P3D v4.3. You will have to tell us each step you did within the .blend file and how you exported it from blender (using the plugin). From the beginning to the end, please. Created smalll animation by added a Path curve and object constraint. With the last blender version 2.79 and the last Blender2FSX/P3D tool (0.9.4) . do you have more ? I understand that blender2FS tool work for both. Ok i will add it after be sure off all. There is no other simulators that a clean P3DV4.3 on my computer. The fsx notes are linked to the Blender2FS tool kit i think because it work for FSX and P3D . There is no link or setting error linked to FSX . 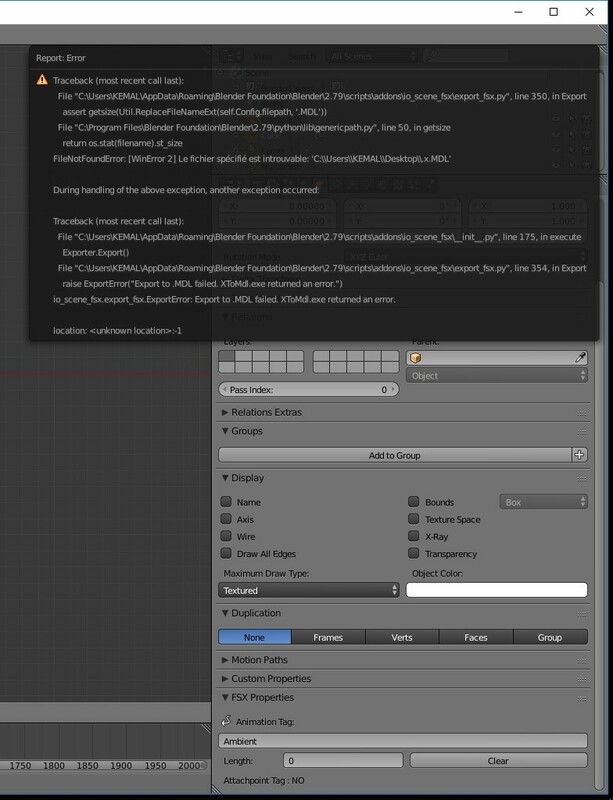 Blender FS tool is automaticly detect my 4.3 SDK . It works perfect with the blender defaut cube. This morning i have verified , materials are linked et configured as required in the Blender2 FS Tool kit manual. I will try with a blender object now to confirm it. Did you,... after setting the keyframes - also set it to interpolation -> to linear? No , sorry where is that function ? It seems there is issues with sketchup models in general. I'm not sure what you mean by SketchUp models... models within SketchUp would have to be brought into Blender for you to animate them... Sketchup can't be used directly for animation with FSX or P3D. Have you setup Keyframes for any of the animations? To change the animation to Interpolation -> linear you can do so from the Dope sheet... open up another screen and change it to the Dope sheet. You will need to do this to all animations that have KeyFrames. Yes my objects are made on sketchup... so i tried to import ADE to animate one of them from now into blender.. yes Sketchup can't be used to animate on FSX P3D from what i know..
"To change the animation to Interpolation -> linear you can do so from the Dope sheet... open up another screen and change it to the Dope sheet. From the dope sheet, you will click on Key tab -> Interpolation Mode -> Linear"
Ok thank you , i am not really familiar with blender and don't see what is dope sheet ... If you have any screen for help it will be very nice. I will search tomorow .thank you very much for your help !